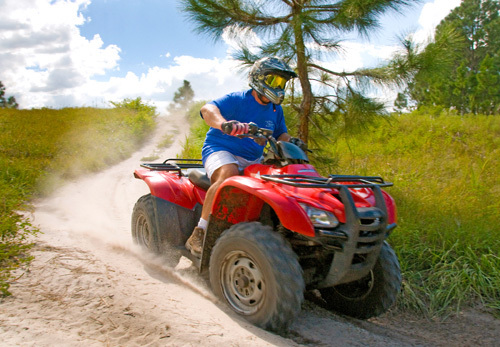 With more than 230 acres of off-road tracks and trails to ride on in the Florida countryside, Revolution Off Road’s ATV Experience lets guests enjoy a unique 75-minute driving experience on an all-terrain vehicle (ATV)—a four-wheeled, single-seat vehicle. Guests of all experience levels are welcome, as all safety equipment and instructions are included. Must be 18 to drive. 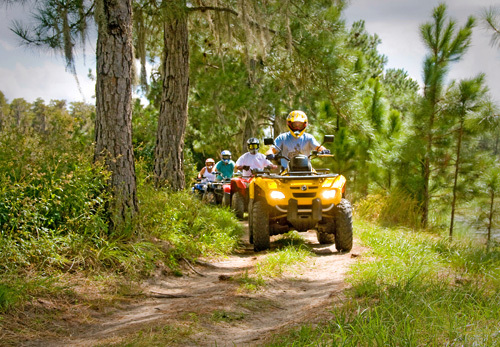 Traverse the Florida countryside via ATV. Encounter humps, grassy banks, muddy dips and dirt tracks as well as some “interesting” man-made trails through the wetlands. In different parts of the world these four wheeled single seat vehicles are called by different names. ATV, Quad Bikes or 4 Wheelers to name a few. At Revolution, it is called ATV (All Terrain Vehicles) and we have over 230 acres of tracks and trails on which to ride them. Set in the heart of the Floridian Countryside with a huge man-made lake in the center of the property this is a true oasis showing the “natural Florida” habitat with an abundance of wildlife. As Florida is mostly flat there are no steep hills, jumps or bolder drops here but sand humps, grassy banks, muddy dips and dirt tracks as well as some “interesting” man-made trails through the wetlands . Whether novice or expert this is a perfect place to try off road driving in a safe environment. After a full safety briefing on our automatic machines one of the trained guides will lead you around the property at a pace to suit you. All safety equipment is included in the price. You should be prepared to get dirty maybe very dirty as you travel over our acres of off road terrain. 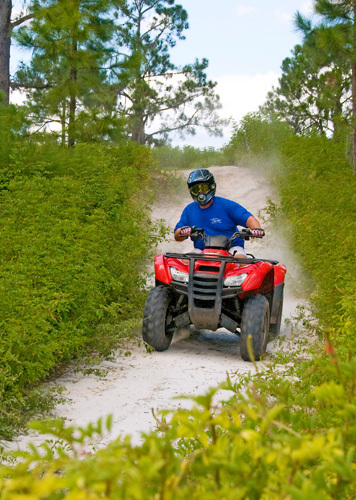 This package includes a 75 minute ATV experience around our 220 Acres of Off Road terrain. You must be 16 years of age to drive our ATV.Under 18, a parent or guardian will need to be present to sign the waiver release form. These vehicles are also known as All Terrain Vehicles, Quads, Quad Bikes or 4 Wheelers. All Drivers must attend a safety briefing and complete the safety course before venturing onto our full course. Closed toe shoes are highly recommended. THIS IS A PER PERSON PRICE FOR ONE DRIVER We only use single seat vehicles we do not offer passengers on our ATV's.